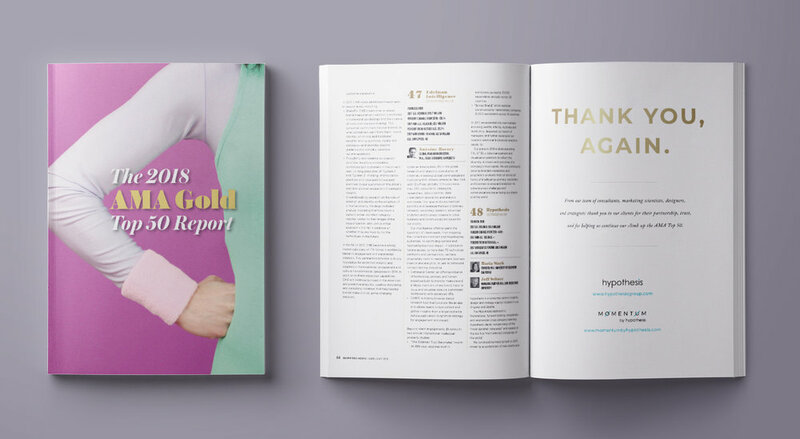 Los Angeles, CA – Hypothesis is proud to announce appointment to the AMA Gold Top 50 Report for the second year in a row thanks largely to an expanded client base, an increase in activation workshops, immersive qualitative, and global quantitative projects. This year’s report appears in the June issue of Marketing News. In 2018, Hypothesis will emphasize growth while maintaining our culture of empowerment and strong focus on foundational, holistic and forward-looking insights. The year also marks the launch of Momentum by Hypothesis. This in-house group keeps the momentum going by translating consumer insights into new products, brand/creative strategy, and marketing campaigns. To learn more about Hypothesis or Momentum, please email mvallis@hypothesisgroup.com, or visit www.hypothesisgroup.com. Click here to download the AMA Gold Report. Hypothesis is an award-winning consumer-centric, insights, design, and strategy group specializing in solutions that are foundational, holistic and forward looking. Our consultants, analysts, moderators, marketing scientists, and designers are all in-house and work closely to develop and effectively communicate insights and stories in a compelling style through beautiful reports, workshops, immersive installations and video. Founded in 2000 and headquartered in Downtown Los Angeles, with an office in Seattle, Hypothesis is proud to work with many of the most innovative, established, and distributive brands and agencies in the world. Hypothesis is proud to be one of the largest independently owned firms on the AMA 50, which helps us be nimble, maintain our culture of empowerment, and truly focus on our client-partner needs. In 2017, in direct response to client needs, Hypothesis launched Momentum by Hypothesis – a team of marketing and brand specialists that helps clients with their “Now What?” This in-house group keeps the momentum going by translating consumer insights into new products, brand/creative strategy, and marketing campaigns. While Hypothesis interprets and brings the consumer voice to life, the Momentum team works to activate and implement the insights – in essence, Momentum picks up where Hypothesis leaves off. Jessica Tornek will serve as president of the newly-formed group. She comes to Hypothesis with 15+ years of brand building and marketing experience from Westfield and Spark Networks as well as agency-side work for clients from Series-B funded startups to well established Fortune 50 firms. The Gold list of the top 50 market research firms across the United States was published in the July 2018 issue of Marketing News, an American Marketing Association (AMA) publication. The report was generated based on 2016 revenue and was published by the American Marketing Association and CASRO. Formerly titled the Honomichl Report, the AMA Gold Report continues the analysis of U.S. companies which began in 1973 first by Jack Honomichl and then by Laurence Gold.